A cross section of the large and unprecedented participation of any political party’s national convention. PLP’s National Political Leader and Prime Minister the Hon. Dr. Timothy Harris addresses the 2018 Annual National Convention. From left, the Right Hon. 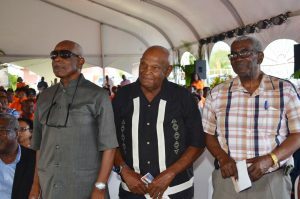 and Right Excellent Sir Kennedy Simmonds, national hero and first prime minister; and former ministers Richard Caines and Hugh Heyliger. Job well done: PLP National Political Leader the Hon. 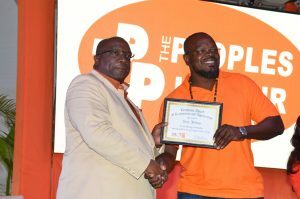 Dr. Timothy Harris presents an award to PLP Constituency No. 6 Branch Chairman Kevin ‘Ninky’ Williams. 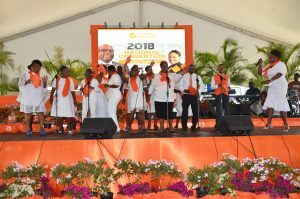 Peoples Labour Party Women’s Arm Representative Sonia Henry and her ensemble entertains participants with gospel renditions before the convention began. 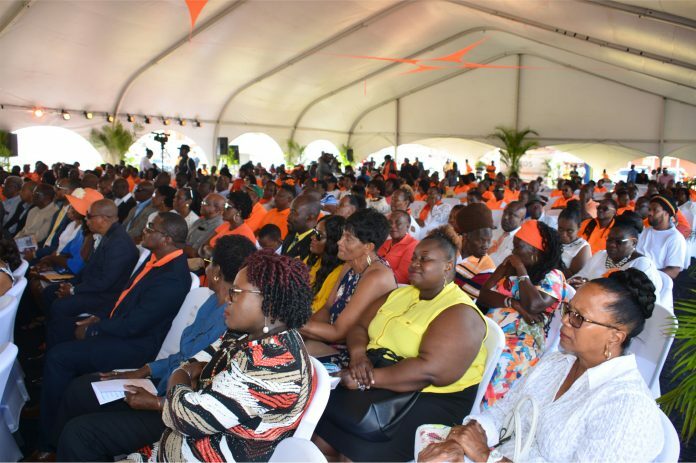 BASSETERRE, St. Kitts – The Peoples Labour Party showed its impressive growth and strength when on March 24 it hosted its second annual National Convention, drawing a large turnout of nearly 700 participants under the huge tent at the Patsy Allers Recreational Ground in West Basseterre. Thousands more watched the event live via social media, and others followed via live broadcasting streams carried by local radio stations. The convention was spiced with a religious component led by the Peoples Labour Party Women’s Arm Representative Sonia Henry. It also featured young gospel entertainer Nyquan Nisbett and well-known artiste Dejour – St. Kitts and Nevis Pride. Fraternal greets came from Team Unity partners led by the Honourable Shawn Richards, leader of the People’s Action Movement (PAM); the Hon. Alexis Jeffers, deputy leader of the Nevis-based Concerned Citizens Movement (CCM); and key supporters, including Anthony Ross QC and Dr. Anthony Sebastian of Canada. Ross and Sebastian were two of the first in the Diaspora to publicly endorse the Peoples Labour Party. Dr. George Walker of the New Democratic Party (NDP) of the St. Vincent and the Grenadines brought fraternal greetings from St. Vincent. 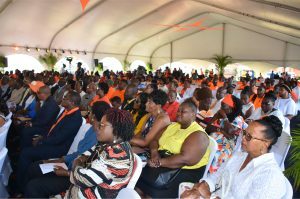 Alva Pemberton brought fraternal from New York, and Lennox Liburd brought and delivered a powerful message of his loyalty to the prime minister and Team Unity Movement. Harris delivered a powerful and sterling address in which he affirmed his enduring commitment to unity and to PLP’s dynamic and supportive role as a grassroots party delivering votes for the team as a whole. 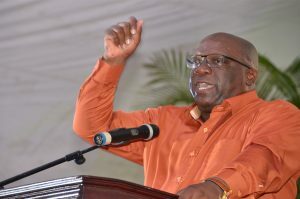 The Peoples Labour Party Leader said the country will face the choice of moving forward with the outstanding works of the Team Unity administration or retrogressing backward with the “stale-dated and disloyal” Opposition party. Represented were the Right Honourable and Right Excellent Sir Kennedy Simmonds, national hero; members of the Federal Cabinet and the Nevis Island Administration, members of the diplomatic and consular corps, former ministers Hugh Heyliger, Ambassador Michael Powell, Ambassador Constance Mitchum and Richard Caines.